Abstract : The simulation of a group of 300 particles and one "repetitive" particle is carried out. The latter is a test of the code and a learning process to understand the behaviour of groups of particles. Two main collision methods are implemented : "quasi-real collisions" which generates collisions from a space distribution of particles and "virtual collisions" where the collisions are generated according to the i-e collision time. The results from the first method could not be interpreted due to the complex behaviour of the particles. One "repetitive" particle under "Virtual collisions" generated a promising result. Two main modules and some auxiliary ones are added to SimPIMF, now version 2.5. One main module is the generation of "Quasi-real Collisions" and simulation of "Virtual Collisions" the other. Modelling collisions is the first step for transport calculations. The next are only some tips about the simulations, not an ordered and complete explanation of the process. Difficulties in the first attempt using "Quasi-real Collisions" simulation. Some tips. - 300 particles were simulated for 150 microsec. It was repeated twenty times for 20 different densities (from ~ 1e16 to 1e20 m-3). It lasted about 1800 s per density. - The quasi-real collisions method calculates collisions considering the real positions of the quasi-particles. - The protons were forced to stand still setting Eproton= 0.00125eV, to avoid the excessive drifts and the change in the profile of density. - Presently there is no representation of the profile of density in the code and moreover the local temporal variation in density generates variations in the collisionality. - The ambipolarity condition is not implemented so the electrons could remain in the central area and the protons (H+) wander around the edge under enormous drifts, so the electron-ion collision vanishes. - Simulations only valid for Beta = 0 or very low. 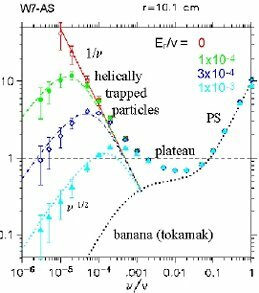 - No thermal diffusivity is modelled but it could be implemented because the existence of magnetic islands, the banana orbits, the helically trapped particles... is intrinsically natural in the present simulations. As a first rough approximation, the flux of particles x Enery is accounted as energy losses. - The i-i and e-e collisions are available in the code but with no Larmour jumps implemented so they were inactive to simplify the results. - There were a distribution of density similar to a triangular one but it was quite imperfect, so it generated even more confusion in the results. - The cross section was the 90º scattering cross section which is not adequate to model trapping-detrapping of banana and helically trapped particles. A better approximation is τeff but then it is not adequate for the passing orbits. - Some initial tests were accomplished for electrons at 10eV and real Bo =40mT . However Te = 2eV was calculated from ISS04 for the nominal regime in UST_1. Thus some particles escaped in a "random" walk after ~3 "bad" steps, which is not statistically valid. Later all the simulations are accomplished at Te=2eV. - An "anomalous" behaviour was observed, an excessive increase of transport in the P-S regime. It seems caused by the inaccurate model of collision if only τei is taken. More information below. - Some good symptoms appeared at the start of the banana regime but too weak to deserve a further analysis. - I had very limited knowledge about transport at that moment so the possibilities to interpret the results were too small. Immediately a simplified module for virtual collisions was developed and the simulation of only one "repetitive" particle was carried out to learn and understand what was happening in the Quasi-real simulation. Conditions and results in "Virtual Collisions" method. Some tips. - Only one "repetitive" electron is simulated. It is always thrown from the same place after escaping. It further simplifies the interpretation of results. From ~150 electrons at the shortest confinement time to 2 particles at the longest escapes (for a total time of 0.075 seconds of simulation). 20 simulations are carried out for 20 different densities. - The random speed after collisions generates a relatively random distribution of particles on the selected surface even if the particle is started always from the same place. The behaviour of the electron is better understood if the location is fixed. - τei was taken in a first try as collision frequency, later 3 * τei to approximate to τeff . The results were promising but the location of the plateau regime was not very exact and some unknown issues remained. - An advanced auxiliary module to compute collisions is implemented. It uses a modified Rutherford scattering cross section that generates a collision angle from 30º to 180º. It comes from expressions and theory in  . The objective is to solve the discontinuity between τei τeff and to generate better modelled collisions. The expression has not been demonstrated but the 90º collision frequency was calculated-simulated from the new expression and the error was only 10% (it does not necessarily imply that the result is correct for 60º ... 30º , but this approximation is much better than the discontinuity. The expression will be deduced exactly and the code will remain almost the same). Angles from the one corresponding to the Debye length (~0º) are impracticable due to processing time limitations There will be excessive low angle collisions to calculate and they are irrelevant in trapping-detrapping effects. - The "Virtual Collisions" method generates collisions according to the Step-time of the particle. The collision time is calculated from a modified cross section to maintain some similarity with Quasi-real collisions but there are some equivalent expressions for the value of τei , so there are not spatial-real-like collisions. However the results are similar for most of the test and learning purposes. - The particle is an electron of 2eV . The magnetic field Bo is ~0.2T, twice the nominal regime of UST_1 in order to increase the number of collisions in the very low collision regime during the whole life of an helically trapped particle, otherwise the random walk has too little steps (collisions) at this extreme low density(~10-14 m-3). - Only fluxes of particles are modelled. Thermal diffusion not modelled yet. - One minor anomaly remains in the simulation. At irrelevant collisionality the particles live more than in a slight higher collisionality because in the first case they arive to the vacuum vessel under trapped-drift movement while in the second case they turn and scape soon after they leave the LCFS. It can be easily solved by improving the LCFS exit condition (now it is a vacuum vessel exit condition). - Several auxiliary modules are common to both Virtual and Quasi-real simulations, so the improvements are useful for both cases. The results are shown in Graph 1. The normalised collision frequency nu* = nu / v . R/Iota is used to compare UST_1 with W7-AS. The plateau regime is taken as 1 in UST_1 case and the other values are proportional. The origin of the data taken in Graph 1 for W7-AS is shown in Graph 2 . Graph 2 comes from  . The normalised collision frequency that appear in Graph 2 is multiplied by R/Iota (2m and ~0.3 for W7-AS) to obtain the other common expression of nu* , chosen here. 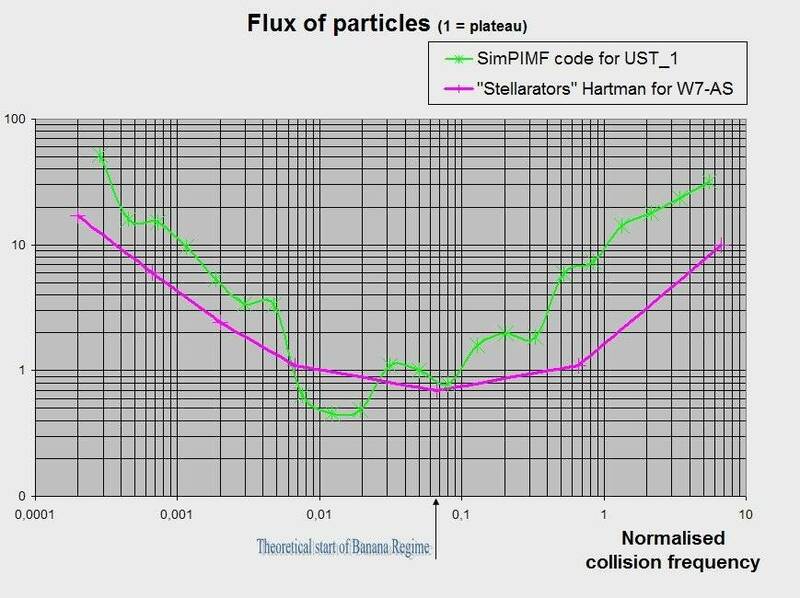 * Both graphs agree relatively well in spite that they are totally different stellarators and that the W7-AS data might be calculated for Maxwellian distribution in the whole plasma volume and for UST_1 only one particle of constant energy is taken in this first test. Helical ripple and clearly modular ripple is higher in UST_1 than in W7-AS so higher losses can be expected in 1/nu regime in UST_1. Around twice as losses are observed in Graph 1. * The oscillations in Graph 1 for SimPIMF simulations might be produced by the use of only one particle (not a group of maxwellian particles) and consequent resonances of field periods and modular ripples with the collision time may occur. If it is true they will disappear when multiparticle simulations were carried out. * The anomalous increase of transport in P-S regime seems that remains in the advanced collision method, but very reduced. It has not been analysed for the advanced collision method but in the old τei method the phenomenon is caused by a low parallel diffusivity compared with the vertical drift at high collisionality. As a result the particles have no time to rotate 1.5 toroidal turns (in UST, Iota~0.3) and they become direct losses like in the collisionless regime, having no true random walk (the drift is in only in one direction and there is neither walk symmetry nor compensation). It is not clear if this phenomenon is real or caused by the model or errors in the code. * It seems possible to roughly calculate the diffusion coefficient D from the one-dimensional probability density fucntion f(x,t) = f(D,x,t) . Taking the values from the simulation for x = distance to plasma edge and t = time of simulation, D can be calculated. The theoretical diffusion coefficients from : Step-size2 / ( 2 * τcoll )  (In some references the "2 * " does not appear) is compared with the simulated values and they agree in the order of twice or half. The method cannot be more accurate due to the indetermination in x and the simplifications in the analytical expressions. The proportion of helically trapped particles appears in the analytical expression, however in the simulation the particle is in pasing state some proportion of time and in trapped (in any of the 3 possibilites) the rest, not exactly the same. * The energy confinement time seems far excessive, even considering the anomalous transport part in the energy confinement time and the simple simulation carried out, very different from a real case. One or two cases in the plateau regime will be graphically represented and carefully analysed to know why the particles do not escape as fast as expected. The methods for collisions are only an initial starting point so they need improvement in all aspects and many new tests. - Analyse one case in plateau regime with respect τE . - Carry out simulations with hundreds of particles in random Maxwellian distribution, first in Virtual collisions method. - Simulate H+ to compare with the results from electrons. - Many others. Graph 1 . 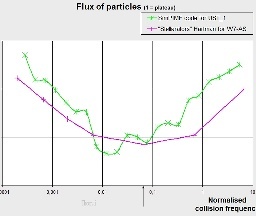 Comparison of Flux of particles in P-S, plateau and 1/nu regime in UST_1 calculated by SimPIMF v2.5 and in W7-AS (see graph 2 for origin of data). Graph 2 . From " STELLARATORS " D.A. Hartmann , Figure 20 ,  . Origin of data for W7-AS in Graph 1. 7 points of the 1/nu , plateau and PS regime, for Er =0 are taken in Graph 1.